Hyderabad: Soon passengers heading towards Shamshabad Airport can travel by zero pollution electric buses which are likely to be pressed into service in a week. About 40 electric buses are to be launched from different parts of the city connecting the airport. The operation of much-awaited electric buses in city will make Hyderabad first in the country to run such fleet sourced under the Union government’s Fame India (Faster Adoption and Manufacture of Hybrid and Electric Vehicles) scheme to boost eco-friendly vehicles including electric vehicles. 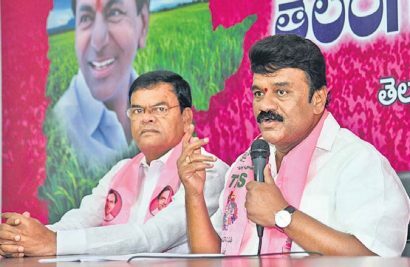 According to Telangana State Road Transport Corporation (TSRTC), while States such as Gujarat, Karnataka and Maharashtra were in the race, Telangana geared up first to introduce one-of-its kind fleet in the country. According to M Ravindar, Executive Director (Engineer), a trial run was conducted on electric bus for around 20,000 km and it was successful. “A total fleet of 100 of these buses are to be introduced and in the first phase, we will be launching 40 buses,” he said. 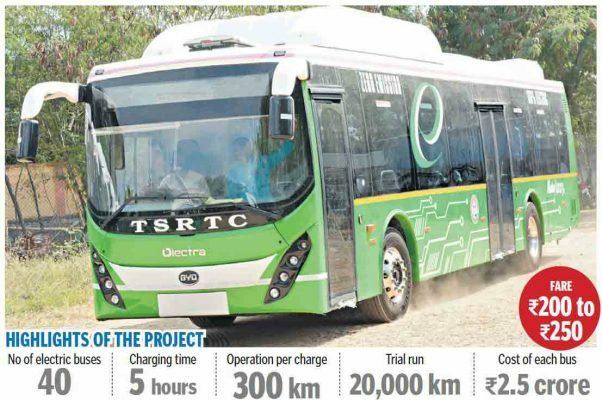 Electric buses once fully charged in five hours enable operations for close to 300 km with fares ranging around Rs 200 to Rs 300 per head, Ravindar said and added that buses which run from Secunderabad, Kukatpally, Tarnaka, Uppal, Hitec City to airport would be charged at Miyapur and Secunderbad Cantonment depots. These buses have been secured by electric vehicles provider Olectra and TSRTC would run them on hire basis for 12 years and the corporation would give Rs 36 for every kilometre to the provider of the bus which has a seating capacity of 40. A senior official said that the operation of electric buses would result in savings of Rs 10 crore every year. “Cost of each bus is Rs 2.50 crore with centre providing a subsidy of Rs 1 crore under FAME scheme,” officials said. Each electric bus is a zero-emission bus and is fully electric having active safety technologies, including collision avoidance and automatic emergency braking. The specialty of Olectra electric bus it that it boasts of real time tracking, passenger information safety, manually openable door, medical kit, glass hammer and fire extinguisher. The electric bus battery pack has a battery management system that monitors safety, voltage and temperature. They have three-phase chargers with fast charging technology and designed with front and rear air suspension for a comfortable ride. These buses have capability to avoid skidding while braking and equipped with LED fog lights and interior lighting that enhance the ambience. The electric buses are also equipped with cameras along with wheelchairs for disabled people.